You are browsing the archive for R3. Softgrid 4.1 migration towards ConfigMgr with App-V 4.6 Integration : The story of automation , Part 2. So that will leave us to creating all the necessary collections ( remember 400 Pieces ) and their lovely 400 AD Group Memberships as this was how the Softgrid environment worked (User Group Based) before. 1. Creating a Dynamic collection membership based on the User Group Resource that will point to an AD Security Groups that contains users in AD for Collection Population. AD Replication to happen – 15 minutes. As this is a dynamic membership collection , it is bound to a Collection evaluation cycle – 60 minutes (this is a very short setting – default is a day). Configuration Manager Client Policy Refresh – 60 minutes (Default). 2. Creating a Direct collection Membership based on the User Group Resource that will point to an AD Security Groups that contains users in AD for Collection Population. User may needs to log off and log-on again. To accomplish step 2 , you will need as prerequisite to turn on AD Security group discovery in your site settings. When done, you could pull out of SQL a *.csv file with all your Security group names and resource id’s as shown below . Please save the file as you will need it in a later phase . Now I need to figure out how to link the ResourceID’s & groups with my softgrid AppID’s & Security Groups ( as shown below ) . However this will not be an easy task as I need to convert a LDAP GUID to a readable security groupname , make the correlation between the previous exported ResourceID/Security group name and the converted GUID SecurityGroupName/AppID . Stay tuned for Part 3 very soon …. ConfigMgr 2007 R3 : Installing Hotfix Prerequisite KB977384 on a Site Server with ICP Pack will fail. When you install an ICP pack on your Site Server , the Site Server version number gets incremented. When you want to install the R3 Prereq hotfix (977384), it checks to make sure it is not being installed on a ICP Site Server as there is no support yet for any other languages than English. In Europe this happens more than in other parts of the world. “This hotfix is not valid for this version of Configuration Manager"
Wait for the hotfix KB977384 with ICP1 and/or ICP2 support to be released. Install R3 on a Site Server that isn’t running an ICP. Today Jeff Wettlaufer has announced at http://blogs.technet.com/b/systemcenter/archive/2010/10/14/configuration-manager-2007-r3-is-here.aspx that ConfigMgr R3 has been RTM’ed. You must all known as well that this is the FIRST release EVER within Microsoft been made that carries the name R3. 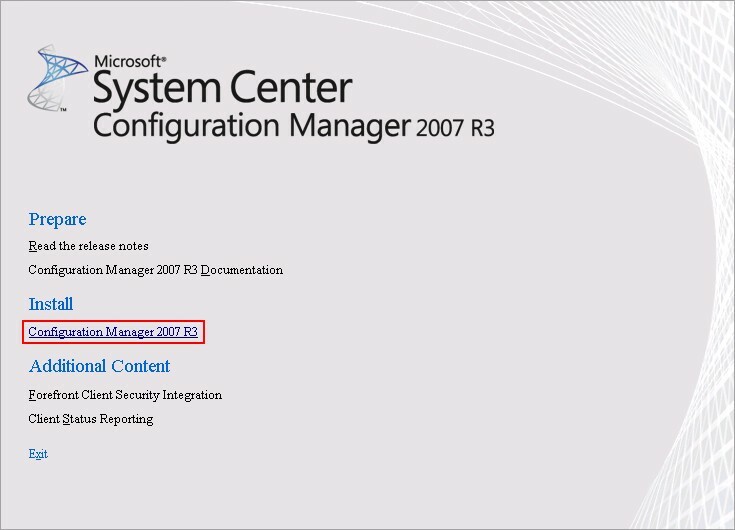 I am very excited to announce and to talk about the release of System Center Configuration Manager 2007 R3. ConfigMgr R3 drives new scenario support to existing world class capabilities. Power Management for Green IT. When combined with competitive, environmental and regulatory pressure, it is really exciting to deliver centralized, policy based Power Management in ConfigMgr. With ConfigMgr R3, 300,000 managed clients per hierarchy could be managed. By tightening the key relationship to Active Directory with finer, more granular polling and delta monitoring, and marrying this with a new ability to rapidly populate those changes into collections. Some additional OSD Scenarios , such a Pre-staged Media. Some always wanted ConfigMgr Administrator console extensions , such as “Add a resource to a collection” on a simplified way. See you at 3 November @ Living Tomorrow when delivering an ConfigMgr R3 session . A customers demanded for local support staff to have a simple feature in ConfigMgr 2007 . This feature would be that when operating system deployment has been launched in production , the Local Support staff would receive a simple email to say that their deployment was succeeded or not without touching any ConfigMgr console. Out of the box , this was not feasible . A colleague of mine ( Merlijn Vanwaeyenberghe) at that particular customer found a rather simple but effective solution . 2. Create two status filter rules as shown below . Create 2 Powershell scripts on your local drive. In my case D:\scripts\TSSucceeded_Email_Notification.PS1 and D:\scripts\TSFailed_Email_Notification.PS1 with the following code snippets that are listed below. $strSMTP = "Your SMTP server "
$strSubject = $strComputerName+": OS Deployment FAILED"
$strSubject = $strComputerName+": OS Deployment Succeeded"
Run a program: path to program with optional parameters !! DO NOT USE "QUOTES" !! Status filter rules can be used to perform an action when an event has occurred, for instance when an OSD Task Sequence has completed successfully or has failed, an email can be sent out to the OS staging team to inform them as shown above . Don’t let it stop you doing it for other tasks as well . Special thanks to my colleague Merlijn Vanwaeyenberghe for sharing this with us . A recent implementation at my ConfigMgr 2007 R3 TAP customer of R3 and SQL reporting services put me thinking ahead for our disaster recovery procedure . SRS Reporting role needs to be installed in the DEFAULT Instance ! Named instances are not supported ! !